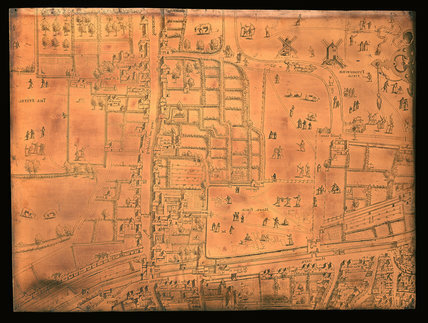 Copper printing plate for The Copperplate Map of London dates from the 1550’s and is the first known map of London. It was made in fifteen sections, or plates, of which only three are still in existence. Two plates which depict the areas around Moorfields and the City are in the Museum of London and a third plate, held by the Dessau Art Gallery, shows the area around St Paul's Cathedral. This plate was later reused and has a painting on the reverse of Nimrod supervising the construction of the Tower of Babel.